When it comes to money management, the majority of fleets hire outside accountants to do profit/loss statements at the close of each fiscal year. They will then compare this information with prior statements to spot overall trends on a year-by-year basis. The problem with this method is that expenses can fluctuate on a monthly or weekly basis depending on the needs of a given operation. This fluctuation can give fleets a skewed perspective on what their actual costs and profits are throughout the year, inadequately preparing them for seasonal shifts in expenses and add pressure to their cash flow. To more effectively calculate your operating costs, it is far more prudent to examine your expenses on a week-by-week and month-by-month basis. This way, you can pinpoint rising costs the moment they emerge and take possible steps to remedy the situation. The following information are some observations on what the greatest operating costs for fleets are, a quick overview on how fleets can calculate their cost per mile (CPM), and some tips and tricks on managing and improving your fleet’s CPM. Because ultimately, understanding the basic financial impacts of your fleet’s operating expenses on your profitability will better serve your business decisions in the future. When it comes to recouping the costs of fleet management, trucking companies will often attempt to squeeze more routes and deliveries into tighter timeframes. In most cases, all this really does is raise the operating costs in tandem with the workloads. One effective strategy is to lower the costs associated with fleet management and eliminate unnecessary expenses. If you can bring management costs down by just $100 per week, the savings can significantly add up over the course of a year. Fuel: Commercial trucks consume at least 40 times as much fuel as passenger vehicles. New Trailers and Cabs: The cost of a new trailer is easily five figures, while the cost of a cab could hit six figures. Tires: The cost of replacing worn tires can add several thousand dollars to your fleet’s annual expenses. Repairs: The overall cost of repairs could depend on the fleet’s preventative maintenance program and how well the vehicles are maintained. Maintenance: Regular preventative maintenance can reduce the need for repairs, yet still constitutes an expense in its own right. Insurance: A fleet must be insured on multiple levels, the total of which amounts to several thousand dollars annually. Driver Salary: The salary paid to drivers accounts for at least a quarter of fleet operating costs. Tolls: Depending on your routing map, you may encounter occasional or regular tolls for using certain roads or bridges. Taxes: Though just pennies on the dollar, taxes add up significantly when tens of thousands of dollars are involved. Whether you run a small or large fleet, these expenses are liable to account for the lion’s share of your overhead. On a per-mile basis, fleets spend an average of $1.38 in operating costs for each truck. When you multiply that amount by the number of miles traveled throughout a typical year, you are looking at roughly $180,000 in annual operating costs for just one commercial vehicle. A commercial truck consumes approximately 20,500 gallons of fuel in a typical year. When you multiply that by the cost of fuel per gallon and tack on the applicable taxes, the dollars are more than triple the gallons. One truck, for example, could exceed $70,000 in annual diesel fuel consumption. Overall, fuel accounts for roughly 39 percent of a fleet’s operating costs. Though pricey, investments in new cabs and trailers can actually help keep costs down over the long run. With the newer aerodynamic designs and higher performance trucks, you are less likely to see performance issues among your fleet. Even if your older vehicles are well-maintained, it can be a cost-effective move to periodically introduce newer cabs and trailers into the fleet. The costs associated with truck maintenance can easily exceed $15,000 per year when you factor in all the parts at play, such as the brakes, alternators, wires, and air hoses. Insurance costs account for roughly four percent of the total cost to manage a commercial truck. With at least nine different insurance policies required in the industry, the cost to insure one truck could exceed $6,500 annually. When broken down into miles, it costs approximately five cents per mile to insure a commercial vehicle. Fixed Costs: These are the costs that you need to shoulder to exist as a fleet — trucks, insurance, permits, leases and more. Variable Costs: These are the costs that fluctuate according to the condition of your trucks and the length of routes. Salaries: This is what you pay your employees, including drivers as well as any administrative staff or mechanics. Various software programs can help you track your costs, including FreshBooks, QuickBooks, and Xero. Otherwise, you can use a calculator and your own desktop documents. In the preceding example, the total in fixed costs for June is $3,600 and thus $0.36 in fixed costs per mile. 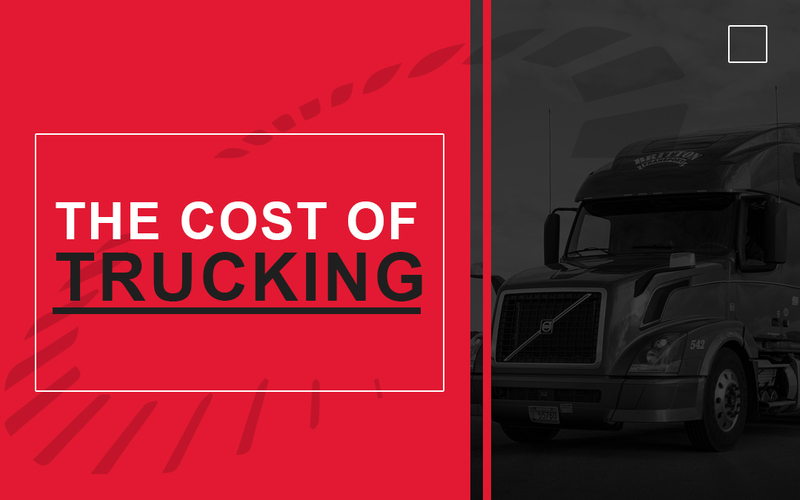 The costs in this category only mount during hours of activity from your fleet — expenses such as fuel, meals, maintenance, hotels, and other costs that are liable to arise on the road. Unlike fixed costs, which are easy to predict as long as insurance rates and leasing fees remain the same, variable costs are liable to change on a weekly and monthly basis. Factors such as markets and weather can impact your total amount in variable costs during a given period. The variable costs for June total $3,410, which divides to $0.341 per mile of variable expenses. Depending on the size of your fleet, driver salaries could make up a significant portion of the expenses for your operation. For Hank’s Haulers, salaries for June accounted for $3,500 of the company’s expenses. When divided by the 10,000 in combined mileage traveled by the fleet, company salaries totaled $0.35 per mile. Therefore, during June, the total cost per mile for Hank’s Haulers equaled roughly a dollar and five cents, compared to the national average CPM of $1.38. Monetarily, the per-mile model can help you manage operating costs on numerous fronts. Internally, the model can help you determine whether certain expenses can and should be trimmed from your budget. Knowing your operating costs on a per-mile basis can also help you determine the most appropriate rate to charge shippers; ultimately, the model can help you boost profits. One of the most costly habits among certain fleets is to prioritize mileage over efficiency. If a company sets an arbitrary weekly mileage quota, certain drivers are liable to stress mileage for the sake of mileage. For example, a manager might set an arbitrary weekly mileage and deadhead the totals for drivers whose actual routes fall short of the mileage in question. In effect, such policies divert drivers from what should be the actual end-goal — efficient, high-volume deliveries. When the latter becomes the focus, fleets can save money by focusing on the most efficient routes for the shortest possible delivery times. Trucking companies love their autonomy, but the most financially stable fleets often delegate their larger managerial tasks to third parties. A small fleet, for example, can partner with a larger fleet to benefit from the latter’s more developed managerial infrastructure. This way, the operators of the small fleet can focus on their core strengths — the management of orders, routes, and deliveries. Other tasks, such as bills, taxes, and insurance, can be handled by the larger trucking company. A similar option is for the smaller fleet to hire a professional employer organization (PEO) for billing and worker’s issues and to partner with a larger fleet for liability backing. Just as certain tasks can be outsourced with greater efficiency, money can also be saved by eliminating select third parties from the equation. For example, if your fleet has relied on the services of a lead-generating company, it might be prudent and cost-effective to cut the service and keep that work in-house. According to Heavy Duty Trucking, some of the most efficient fleets have only one non-driver on staff for every five trucks. By contrast, the average fleet will have a non-driver for every three trucks. If your in-house team is lacking some of the skill-sets in question, consider holding company training sessions to diversify their skills. For obvious reasons, an accident is one of the biggest hits that a fleet can take to its finances and reputation. In 2012, the Department of Transportation tallied 4,000 truck-related fatalities out of some 333,000 roadside accidents. Regardless of whether driving accidents can ever be eradicated entirely, you must make this your goal as a fleet operator. Implement daily safety checks by training drivers to inspect the tractor trailer for safety concerns: this includes excessive corrosion at the wheel-end, underinflated tires, and loose lugnuts. Consider using visual indicators to assist the driver in performing quick inspections, such as loose lugnut indicators. Some of the biggest dangers for fleets involve harsh weather and winding, uneven terrain. To ensure the safety of your fleet, organize training sessions to boost awareness among your staff on how to drive hauling trucks in inclement weather. These sessions should include training on how to avoid injury and report dangerous roadside situations. Emergency repairs are many times more expensive than scheduled repairs. Two of the most common causes of roadside pullover emergencies are tire and engine failure. With a simple, daily once-over of the tires, drivers can reduce the risk of such emergencies. As mentioned above, train your drivers to inspect tires before embarking on each route. And to help prevent tire blowouts due to unplanned damage, such as debris on the roadway, consider utilizing a glycol-free tire sealant to protect the tire from the inside-out without causing dangerous corrosion at the wheel-end. Healthy, energetic drivers make fleets more efficient and profitable. Unfortunately, a lot of drivers are challenged in this department due to the unhealthy foods and irregular sleeping schedules that often come with the terrain. To get the most from your fleet, you need to encourage healthy eating and sufficient rest among your drivers. With today’s routing apps, it is easier than ever to pinpoint decent food sources and rest stops where drivers can eat healthily and sleep well along the American roadways. Fleets that use lower-grade fuel in order to cut costs often times get exactly what they pay for. Far from being a money-saver, cheap fuel lacks the refining additives that help engines run smoothly. Cheap fuels leave deposits in the combustion chamber and valves of a truck, shortening service life in the process. If your trucks are constantly in need of service work due to problems with the combustion and injectors, pay for higher quality fuel. In the long run, premium grade fuel can save you money that might otherwise be swallowed up in truck repairs. And if you’re concerned with the cost of fuel, invest in technologies to improve your fuel economy to ensure your fleet goes more miles with less fuel. A seldom addressed yet costly habit among drivers is engine idling. When you allow a truck to idle for 10 seconds, the engine burns more fuel than it does during ignition. Over the course of a year, daily idling of several minutes can lead to engine problems, whereas multiple daily ignitions only have a minimal effect. Barring stop lights and traffic situations, drivers should avoid allowing an engine to idle for more than 10 seconds. In the past, fleets have incurred excess operating costs due to poor routing. With today’s routing apps, however, fleet managers can more easily find the quickest, easiest routes to a given point of delivery. In many cases, these routes are off the beaten path. With better routes, your drivers can increase delivery rates and avoid the dangers and congestion of busy roadways. With over forty years of knowledge in the commercial trucking industry, IMI has developed solutions that maximize fleets’ cost-per-mile. With solutions such as IMI FLEXX, to increase tire life and improve fuel economy, or IMI Sealants, to protect fleet wheel-ends from corrosion or expensive and dangerous tire blowouts, our team is ready to understand your challenges and bring value to your bottom line. To learn more about solutions that can help you keep your fleet efficiency improving, explore the IMI website or contact us today.